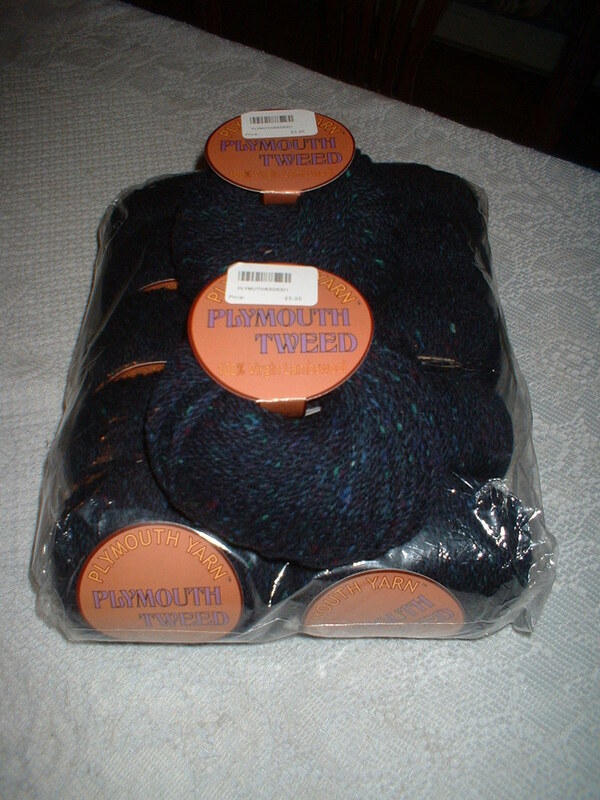 It's navy blue Plymouth Tweed, for the Central Park Hoodie Knitalong, which starts Sept. 1st. Believe it or not, I do knit with colors besides pink!!!! (Though it's my first choice!) (And I've just started working on the pink camisole top again, to give my pink knitting equal time). 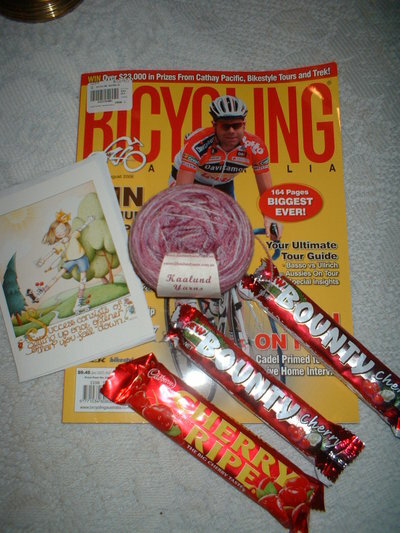 Donna of Random Knits sent me this really pretty pink yarn, too, in a little swap we did. I have never seen it before; it's laceweight from Kaalund Yarns and the color is Magnolia, which is exactly the same as the color of the blossoms in our magnolia tree in the backyard. Lynne, thank you so much! This box is extra special coming from Lynne, as we are both embarking on the process of selling our homes and moving at the same time, and all the fun that entails. And of course I'm already signed up for next month's exchange, when the color theme will be...you guessed it...red and pink! It was a lot of fun to read everyone's comments from my last post on the Knitting Notebook. We all seem to have our own system, depending on the number and type of patterns we have. I don't have many yet, but I can appreciate how you can have one notebook just for sweaters, shawls, men's or babies' clothes. That is a great idea. I'm trying not to collect too many patterns as I get overwhelmed by all the great things there are to knit, and I'm trying to keep my yarn stash very small. But the internet is a wonderful thing...and I may need multiple notebooks soon. Also thank you for your good wishes for my father. He's doing really well, works long days as a carpenter, and has scans twice a year to keep an eye on things. I hope we all see the day soon when a cancer diagnosis means nothing more than a prescription, and it goes the way of scarlet fever and TB and those scary diseases of the past we don't hear much about anymore. Until then, I'm going to hug my friends and loved ones a little tighter!! The stole is looking so, so good! I'm sending an e-mail that might help with the grafting (or might not!). Your packages are great! 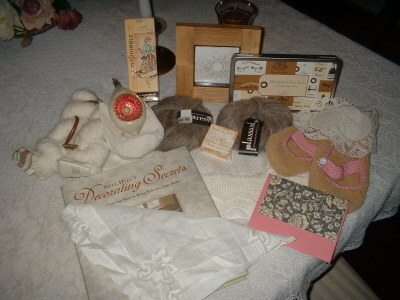 What wonderful things you received. That is absolutely beautiful, I just love the stitch and the color, it looks soft and inviting. Okay those candies sound wonderful. What's not to like chocolate, cherries, and coconut. 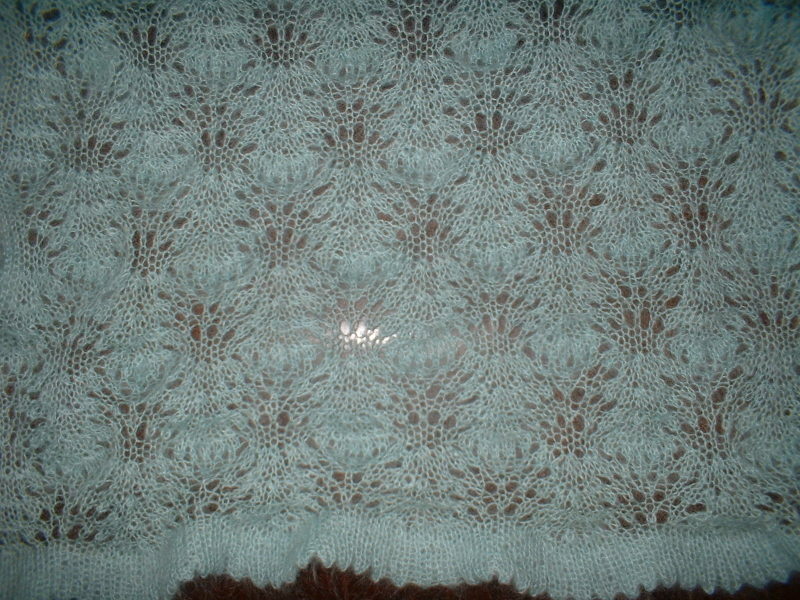 Your lace stole is very beautiful! 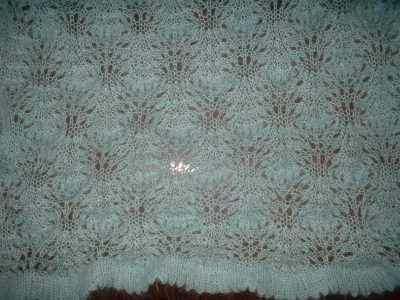 I always admire people who are so patient to knit lace. I also wish the day when discovery of cancer is no longer striking would come soon! In the meantime, we should all enjoy and cherish what we have at the moment. I'm glad that your dad keeps himself busy and is enjoying his life. I think this is the most important thing. All the best! The stole is beautiful! Enjoyed seeing all of the goodies the mail brought you. My elderly neighbour buys my children chocolates and every now and then she gives me a cherry ripe. I haven't even tried the cherry bounty yet but if it is anything like the original, YUM!! The stole is stunning. What a good photo of it too! I'm looking forward to seeing the plymouth tweed version of the hoodie. Oh, I'm so hungry from seeing those chocolate bars, they sound amazing! The stole is sooo pretty; you must be excited that it's almost done. Chocolate, cherries, coconut - 3 of my favorites in any and all combinations! grafting through already knit stitches isn't so hard. If you look at the already knit stitches you can see how the grafting yarn should go (it should mimic the yarn on the row below the already knit stitches). 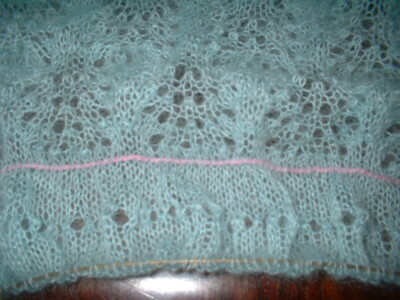 I didn't realise the shawl isn't finished yet! That edging is lovely but I'm afraid I don't have any suggestions. You're sure to find something on the web, though. I've realised recently that everything I knit is pink too! It's completely unintentional. I wouldn't even say pink is a fave colour of mine. Odd. I'm so glad your Dad is holding up so well and leading a full life. Yesterday we had good news about my father in law. He's been given the all-clear for the next 6 mnths. Good luck with your grafting. (BTW, that tweed is just fab). Goodbye, Summer My Amazing Lace, at last. A big thank you to C and Floyd Landis, for inspiration and their determination to finish, no matter what.